What Is Really Behind These Mass Animal Deaths? Researchers are starting to believe there is cause for concern due to the steady increase in mass animal deaths. They also warn that human actions may be to blame. Recently, 95 false killer whales (a species of dolphin that resemble orcas) were beached in Everglades National Park in Florida. It is the fourth mass stranding of the species that we’ve recorded, yet experts still don’t know why such events occur. Some theories have been presented, such as pods chasing prey into shallow waters and getting trapped or following the distress call of one sick or injured individual. Other theories to explain such events normally include cetaceans eating toxic algae blooms or ingesting pollution from nearby human activities. We often write off such events as a bizarre but natural part of our planet’s ecosystems. However, the size and frequency of recent mass animal deaths are starting to alarm researchers. In 2015, researchers from Yale, the University of San Diego and UC Berkeley reviewed case studies of mass animal deaths dating back to 1940. They found the events to be increasing at a rate of one additional event per year. The shear number of mass animal mortality events that have already been recorded in 2017 does little to alleviate these concerns. On January 3, drivers along route 22 in Bethlehem, Pennsylvania were alarmed to find it was raining birds. Dozens of deceased birds littered the route as they all just began dropping from the sky. Researchers studied the bodies of the birds but were unable to determine a cause of death. Ten dolphins have now washed up along the Cornish coast in England. Experts can’t seem to pinpoint a reason for the deaths. Experts in Australia are blaming an extreme heat wave for hundreds of crabs washing up on the shores on Bribie Island. The weather conditions may also be to blame for 80 dead fish washing up on the shore of Queensland. A chemical leak from a tanker resulted in the death of 50,000 fish in Oswestry, England on January 19. Blackwater (water contaminated with feces) is to blame for hundreds of dead fish washing up on Hindmarsh Island in Australia in mid-January. In 2011, mass blackbird deaths occurred at two separate locations over the same weekend. In Arkansas, as many as 5,000 birds just fell from the sky. Another 500 did the same in the town of Labarre, Louisiana. Initially, researchers assumed some type of disease had caused the deaths. However, tests revealed that they all died of trauma. The leading speculation is that something spooked the birds causing them all to crash into things, though no one knows for sure. How likely it is that all 5,500 birds were involved in fatal mid-flight crashes over the same weekend is up for some debate. In late 2008 and early 2009 there were four separate mass whale strandings along the same Australian coastline. The first incident involved 60 pilot whales. 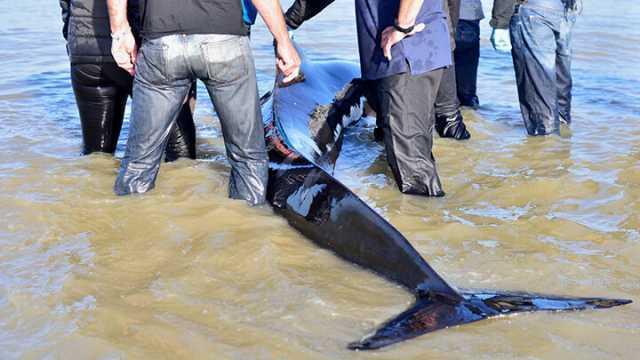 A week later, there were another 150 long-finned pilot whales stranded. This was followed by 45 sperm whales in January 2009. Then, a couple months later, 194 pilot whales beached themselves along with a few dolphins as well. While these events have been known to happen, the large scale of the beachings in close proximity to each other still has researchers stumped. This event from 2005 is particularly baffling. Over 1,500 sheep opted to jump off a cliff in unison. The first 450 sheep were killed. The remaining 1,050 survived since their fall was cushioned by the sheep who had already jumped. While these types of mass animal suicides occur in other animals, such as lemmings, researchers are still a little stumped on what caused these sheep to take the plunge in the first place. Going way back for this one, in 1754, a town in Connecticut was littered with hundreds of dead bullfrogs. It was referred to as “the Great Windham Frog Fight.” People speculated that the frogs were fighting over a pool of water during a drought. But if that is the case, how come all the frogs died? Would there not have been victors in this war? While this story has made for great folklore, there are plenty of holes in the given explanation. The above examples are just a sample. One could spend endless hours on the internet researching similar events that have occurred throughout history. Are human actions to blame? If such events have been steadily increasing, we have to wonder if human actions are to blame. One theory is that ecosystems have been thrown so far out of balance by human development that it is causing sudden changes which some animals are unable to adapt to. According to the 2015 study referenced above, human actions are to blame in nearly 20 percent of mass animal mortality deaths, though that is only for those with an explainable cause. Whether it is a tanker leaking chemicals into a pond, pollution causing poisonous algae or climate change causing extreme weather patterns, there can be no doubt that our actions are causing such events to increase. As for the unexplained events, these arguably represent evidence that our actions are causing ecosystem changes at levels we don’t fully understand yet. Previous articleShould You Swallow Your Phlegm During A Cold? Hey Buddy!, I found this information for you: "What Is Really Behind These Mass Animal Deaths?". Here is the website link: https://www.thealternativedaily.com/what-is-behind-mass-animal-deaths/. Thank you.